History, animals and humans intersect where a farmer once reined in his cows. HERE STANDS HISTORIAN Frederick L. Brown, holding his new book, and farmer Jess Jensen, holding the roped reins attached to his four cows. The two-legged animals pose near the intersection of Northwest 58th Street and Eighth Avenue Northwest, although across about a century of time. Before Ballard’s 1907 annexation into Seattle, 58th was named Times Street (not knowing better, I propose that it was named for this newspaper). Resting comfortably at the base of Phinney Ridge, Eighth Avenue, then called Division Street, served as Ballard’s eastern border. Jess and Kjerstine Jensen were Danish immigrants who built their home in Ballard in the 1890s. Like most of Ballard’s first flood of citizens, Jess easily found hard but sustaining work with a lumber mill on Salmon Bay. He signed on with one of the largest, the Ballard Stimson Mill. If Brown and Jensen could have bridged the century at this corner, the historian might have asked the farmer for the names of his cows. While paging through Brown’s book and pausing at Page 58, where this snapshot of Jensen and his bovine quartet is printed, Brown would not have missed the chance to ask Jensen for the photo’s date. Perhaps it was 1907 or soon after. 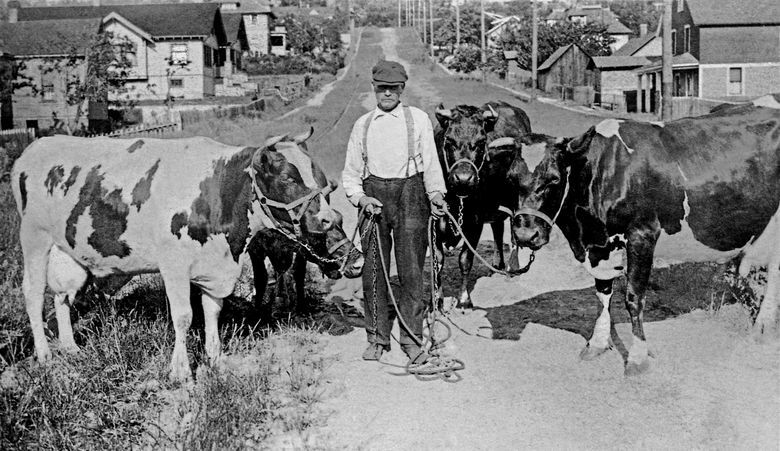 One of the first freedoms lost in 1907, with Ballard’s annexation, was a cow’s liberty to wander the neighborhood. Here Jensen has his cows roped. Brown notes that Eighth Avenue, in the snapshot, makes a more inviting pasture for the cows than a paved arterial. 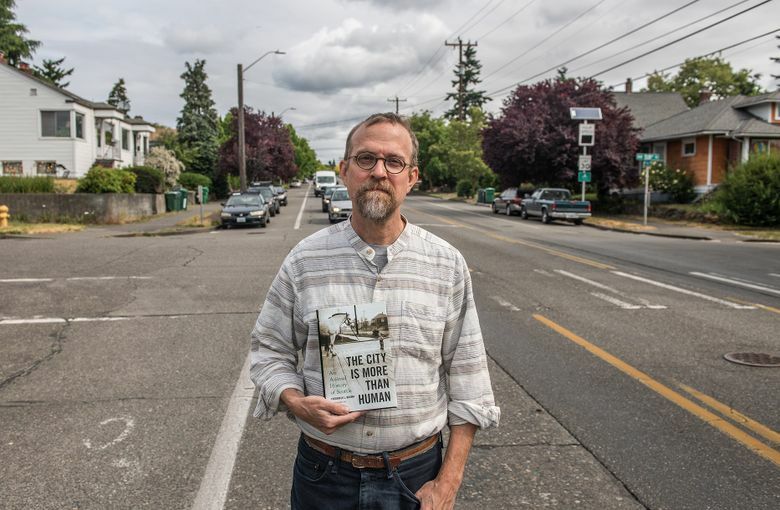 Brown clarifies the title of his book, “The City is More Than Human,” with a subtitle, “An Animal History of Seattle.” Once you have read the book, you might feel you have been talking with its subjects: beavers, cougars, cattle, horses, dogs, cats, pigs, chickens and salmon.